The shares rose as much as 11 percent, the steepest gain in about five years, after Next said pretax profit for the year ending this month will be 684 million pounds ($1.1 billion) to 700 million pounds. That compares with October’s forecast of 650 million pounds to 680 million pounds. Next has become one of the most successful U.K. retailers, due largely to the consistency of its offer, according to Bryan Roberts, an analyst at Kantar Retail in London. While rivals such as Debenhams Plc (DEB) and Marks & Spencer Group Plc (MKS) began offering discounts before the holiday, Next stuck to its policy of waiting until after Christmas to start its clearance sale. Debenhams said this week that profit will drop in the first half because of stagnant sales and increased discounting. Next was up 9.7 percent at 6,065 pence as of 9:50 a.m. in London, extending last year’s 47 percent advance. Discounting before Christmas “just wasn’t a question,” Next Chief Executive Officer Simon Wolfson said today in a telephone interview. The retailer started its traditional clearance sale on Dec. 26, with shoppers lining up outside stores overnight to catch the best of the bargains. “Ultimately you are competing against your own numbers last year, so if you didn’t discount last year it’s easier not to discount this year,” Wolfson said. Total sales under the Next brand rose 12 percent in the period ended Dec. 24, compared with the 3.8 percent median estimate of 11 analysts compiled by Bloomberg News. Growth was driven by the Next Directory home-shopping unit, where sales increased 21 percent. More customers shopped at Directory up to the weekend before Christmas because of increased confidence in online deliveries, the retailer said. Directory accounted for more than a third of sales and half of earnings in the first half of the financial year. 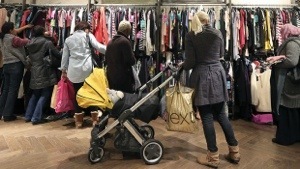 Sales at the retailer’s stores gained 7.7 percent, boosted by improved knitwear, nightwear and gift ranges, Next said. The retailer will continue to push “for design and quality,” and won’t seek to compete on price with budget chains such as Associated British Foods Plc’s (ABF) Primark, Wolfson said. Next said it’s “very unlikely” that the strength of its performance over Christmas will continue through the first half of the new financial year. Pretax profit in the coming year will grow “broadly in line” with sales, the company said. “Although Next has an impressive track record as a retailer delivering continuous improvement on margin, we believe the improvements from here will be modest in nature,” Jamie Merriman, an analyst at Sanford C. Bernstein, said in a note. Despite a weak consumer economy, Next is plowing ahead with store expansion, which it says provides a boost to online sales as more than a third of orders are collected from the shops. The company will increase selling space by 4 percent this year, more than in previous years, Wolfson said. For its online business, it will introduce versions of its website in seven languages, including Polish, French and Spanish, he said. Shareholders will be paid a special dividend of 50 pence a share on Feb. 3 as Next said it’s generating more cash than it can invest productively in the development of the business. The retailer expects to return a further 300 million pounds of surplus cash in the year ahead, through either further quarterly special dividends or share buybacks.